I had a fabulous weekend in the Sangre de Cristo mountains with my church peeps. Twice a year the ladies from my church get away for a scrapbook weekend. Scrapbooking is one of my favorite things, but lately I just haven't been feeling the love for it. I've been trying to get into digital scrapbooking and while I find it fascinating, I don't find it intuitive. Anyway, I was on the fence about joining my church friends this time around. John talked me into it...and I'm SO glad he did! I had SO MUCH FUN! I've been on countless scrapbooking retreats over the years. I usually spend lots of time before I leave organizing my photos and supplies and gearing up for maximum productivity because I don't want to feel like I've wasted my time and money. Wanna guess how many pages I completed this weekend? Zero. Goose egg. None. Nada. Zip. Wanna know how I feel about that? I took the pressure off of myself to "do" and let myself just "be". I went on a hike. 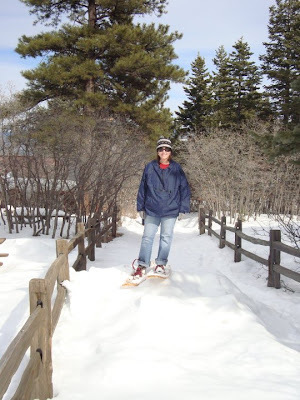 I went snow-shoeing for the first time (so much stinkin' fun!) I laughed. I laughed a LOT. I spent time talking with friends. I slept. I rested. I worshiped. I did pretty much whatever I felt like doing. I let myself have fun. And I feel SO refreshed. The weekend was a gift to me, and I realize that while I didn't walk away with something tangible to show for my time (scrapbook pages), I walked away with lots of intangible things--like a full heart, deeper relationships, and a buoyed spirit. And those are the things that really matter anyway! I'm so glad you had a wonderful time away! I can't imagine being able to take retreats to the mountains on a regular basis! I grew up in the So Cal area and went frequently to the mountains and I feel so at home there, I think if the Lord ever moved us to the mountains I would rejoice! Bless you sweet Mer, you are loved by this person here in TX! Sounds wonderful!! I'm headed out of state for a women's conference with a friend in 11 days. Cannot wait! I had a similar experience last week when I had friends over for crafty morning. They crafted, and I just hung out and had fun with them. We need those times. Congratulations! You gotta fuel up to motor. What a great weekend! I'm so glad you enjoyed your time away. 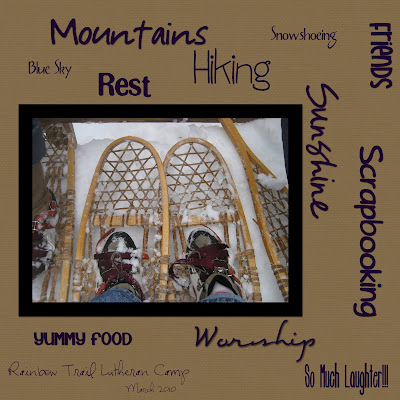 I love the snowshoe pictures - you are so cute! Ahhhh... I can hear the freedom in your voice! I'm glad the weekend was so great and refreshing for you! I love scrapbooking too, but it's been soooo long since I sat down with it. Digital doesn't intrigue me - partly because I do a lot of graphic stuff on the computer for work anyway, but also, I love to feel and smell the supplies. Me = nerd. Filling our mind with the memory should be much more important than filling the pages. Needed this advice today myself as my post is about albums. by the way mentioned you in it also. Glad you had a good time! Isn't scrapbooking just the excuse to get away, have fun & relax? I've started calling them srapbook retreats instead of weekends. My friend Shelley and I have stopped packing up all our scrapping gear when we go for a night or a weekend at the beach house. We won't get to it. ;). And, yes, while there is a time and place for productive fun, there's also a time and place for this, which feels like a sabbath to me, in a way. So glad you had fun, Mer. Lurve the snowshoe pic. AWESOME!! So glad you had FUN!! And laughter is truly the BEST medicine. I think for moms especially!! I had my weekend a few weeks ago- and I totally agree..it is wonderful you feel full of life and renewed when you come home!! I really think I need one of these. Seriously. Soon. I knew you would enjoy this weekend once you got there! Love the fact that you didn't scrap. That is exactly what happens to me every time I do one of these sort of things. I am SO due for a weekend retreat. Wedded Wednesday: In Front of the Kids?